We have a lot of customs in the new year season. Shimenawa is one of the customs. 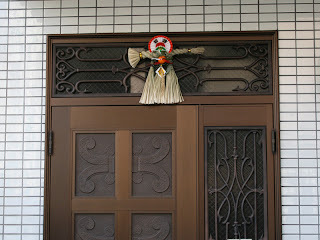 We put shimenawa on the entrance door during new year days. The custom comes from Shinto. Shimenawa is rice straw rope, separated outside and inside. Japanese people believe shimenawa guards against evil spirits. So, you can see it in front of Shinto shrines anytime. Izumo Taisha in Shimane has the largest shimenawa. They change it every three years.